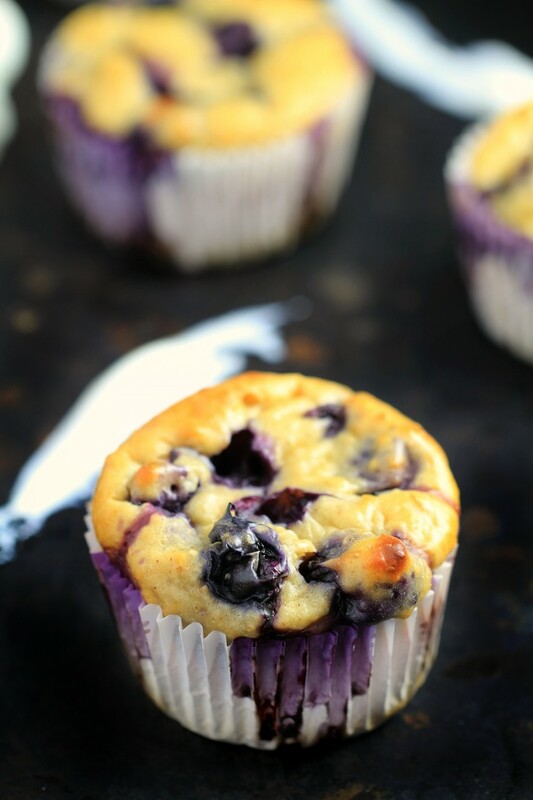 Blueberry Oatmeal Greek Yogurt Muffins - Frugal Mom Eh! 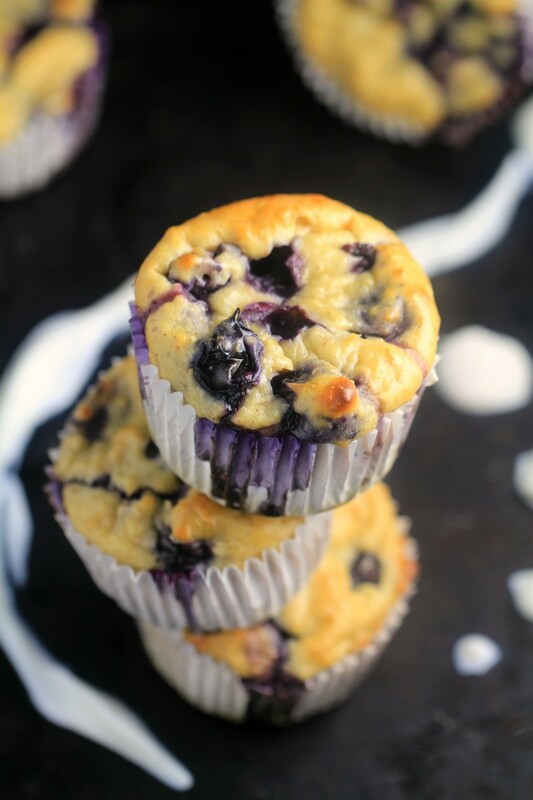 These Blueberry Oatmeal Greek Yogurt Muffins are bursting with blueberries and oats and make for a healthier muffin made with NO butter or oil! Perfect for breakfast, dessert or a light snack. 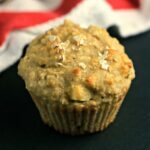 I’ve been making these muffins for awhile now, they are great for giving to the girls for breakfast and a much better choice for my husbands lunch bag than the high calorie store bought muffins. 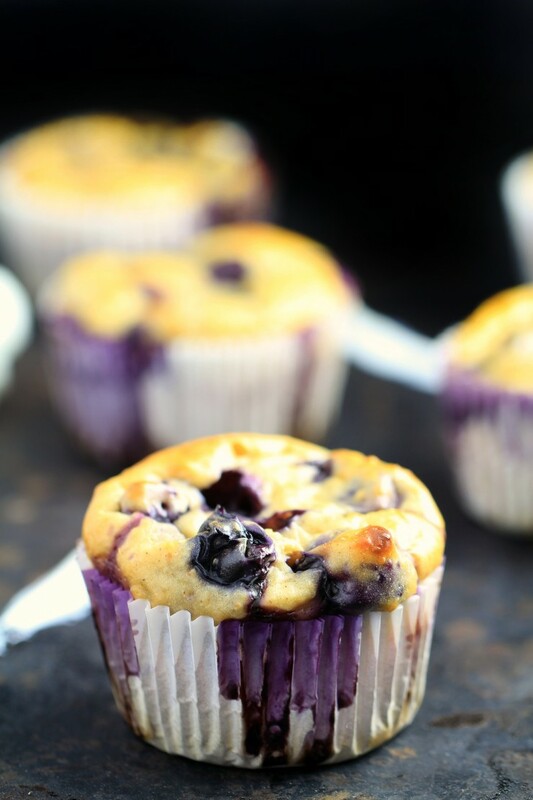 Plus the blueberries in this recipe… wow! It’s funny though, I decided I had gotten this recipe down to a science enough to share with you. I decided to line the muffin tray with white paper liners. I thought it would be pretty but didn’t think about the low fat content of the muffins and the muffins stuck to the paper. I wanted a shot of the inside of the muffins to show the texture was the same as normal muffins though so I decided I needed to make more without the paper liners. Also I’m pretty sure I forgot the baking powder and used too much milk because they didn’t rise quite as much as usual, and they didn’t have their usual oaty appearance. So I started over again and lined my muffin tray with silicone liners. I made up the batter. I spooned it out and put the pan in the oven. The timer went and when I took the muffins out I realised that I had forgotten a crucial ingredient: blueberries. The muffins were otherwise perfect though – they had risen nicely, perfectly cooked and easily popped out of the silicone liners. On I went to round number 3. This time I was suer to include the blueberries. Timer went off… and the muffins were a whole lot more browned than they should have been… probably because the oven had been going for over an hour by that point. Round 4… after shutting the oven off for a few hours I was finally able to make perfect muffins. …. but after looking through the shots I took I decided I preferred the look of the white muffin liners and went with the shots from the first go. I’m also pretty sure that I am over blueberry muffins for the next little bit at least. *Percent Daily Values are based on a 2,000 calorie diet. Your daily values may be higher or lower depending on your calorie needs. Values based on recipe being created with non-fat Greek yogurt and skim milk. They do look good, like that they have greek yogurt in them. I need to pick up some silicone liners at some point, keep meaning to. 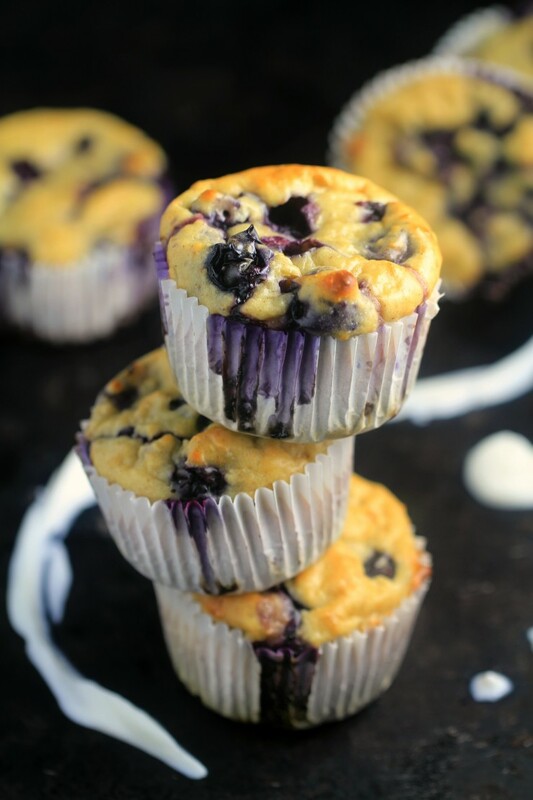 …one of the best muffin recipes I’ve come across! 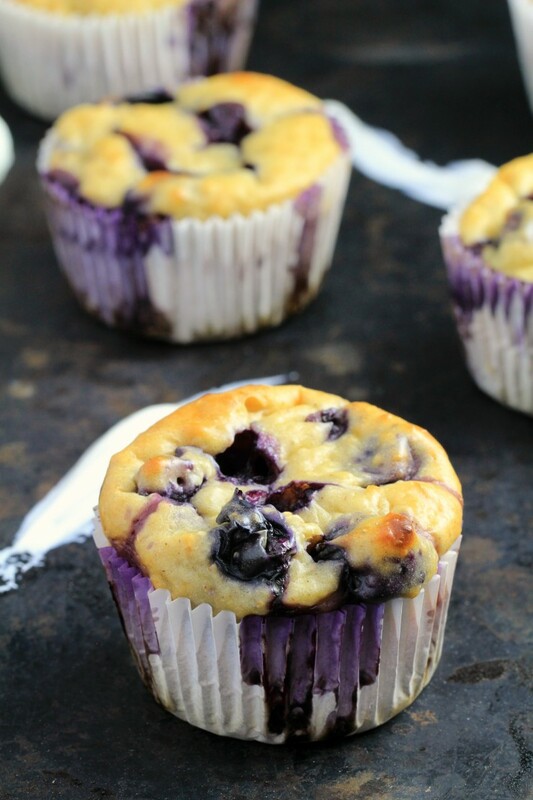 These look so moist and yummy – my kids LOVE blueberry muffins and I always forget to make them. I’ll have to try this one! Thanks i love blueberries muffins and this recipes sounds nice and moist! What’s your opinion of lightly spraying a muffin tin with vegetable spray and skipping all types of liners? I did that instead of the liners and they came out just fine. I like the muffins but they are not a sweet muffin which is ok with me. agreed! My kids aren’t crazy about them because there is no sugar in them. But I love them for breakfast with a little spread of butter. YUM! 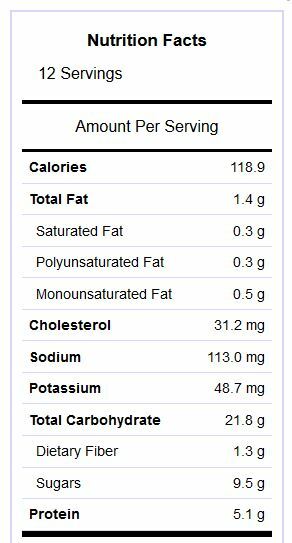 Sorry if I missed it, but do you have the nutrition breakdown for each muffin? Just added to the bottom of the post for you! 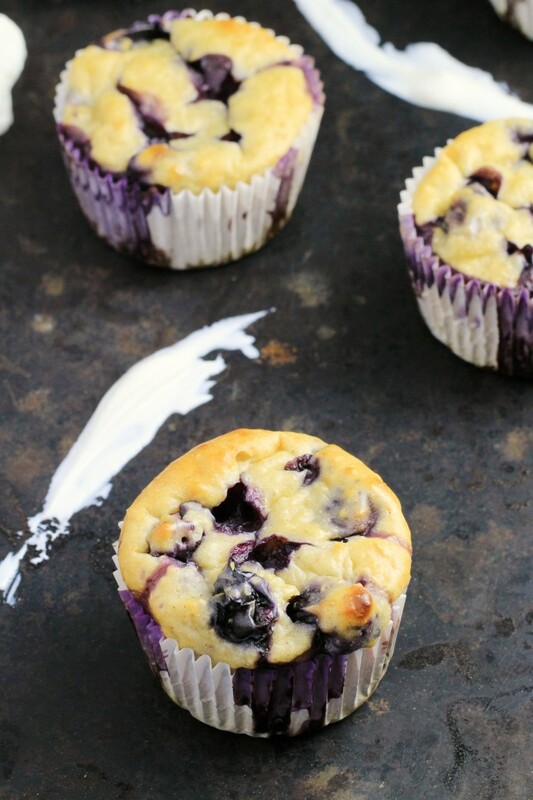 If I use the frozen berries, it won’t make the muffins soggy during cooking? I used fresh, but I usually use frozen when baking and haven’t had a problem like that. Can you use gluten free flour instead of all purpose flour?? I substited the all purpose flour with oat flour which I made in the nutri-bullet. The muffins tuned out delicious! My 11 year old had 3, one after the other. The whole family is now a big fan of these. I am book marking this recipe as a family favourite!! Mine turned out rubbery, I baked them for 20 minutes and followed the recipe exactly (or at least I think I did). Did I just cook them too long or is there something else I could have possibly done wrong? Oh and I used silicone liners! Mine went rubbery when I forgot baking powder. I guess it could also happen if your baking powder isn’t active? muffin pan, and the other six in paper lined muffin cups. The ones baked in the silicone tray came out easily, the paper lined muffins stuck to the paper very badly. I would not make these again. I forgot baking powder and accidentally put in too much milk and they got a bit rubbery and weird (mentioned in my post). They will never have a cakey muffin texture but they should be far from heavy and rubbery when made right. I also did mention several times that you should definitely not use paper lined cups. What about using instant oats vs rolled oats? Just stumbled upon this recipe. Weird question but how long can I store these? I plan on making them this weekend but will be gone for a couple days. Trying to determine if I should just make them after I get back. Totally disappointed that I just made these and after they were baking I saw the note at the very bottom of this page saying that the batter will stick to the paper liners. Probably a disclaimer that should’ve been put at the top of this recipe considering most people bake muffins in paper liners. The bottom half of every muffin was left in the liner. That’s too bad, however I do mention it in one of the first few paragraphs, I also said to use silicone liners in the actual recipe directions, and included the note at the very bottom again to make sure it was caught. It is important you read a recipe in full before you start baking to avoid errors like that. EXACTLY! ALWAYS read the entire recipe and all notes that are included in the recipe before making the recipe!!! Don’t blame someone else because you’re lazy!! Same problem here, the only flavor in these was the blueberry spots. I was hoping for more sweetness. I followed the recipe to a tee.Any suggestions? I added lemon zest and a little stevia on top, as well as cinnamon! The flavor was a lot better once I did that the second time around. Do you have a high altitude baking temp/time? Followed the recipe almost exactly (I had to add 3 minutes to the baking time) and they are so delicious! Could you use 1 1/4 cups of plain yogurt instead of the greek yogurt + milk? No idea, not sure how well this would work with plain yogurt. The milk is just to add moisture, you could use water in place of the milk although it might not taste quite as good. I used plain, nonfat “regular” yogurt in place of the Greek yogurt (1 cup) and it turned out fine, didn’t change anything else to compensate either. Mine stuck with aluminium liner but not as much as with the paper. I used non fat Yogurt and think that is what causes the muffin to be a bit tough. Thanks for the recipe. I used strawberry banana Greek yogurt because that’s what I had in the fridge and I replaced the milk with organic almond milk. They turned out good for me! I was wondering if I should store them in the refrigerator though? You mentioned having them around for 3 days at most, do you store them at room temperature? They aren’t as sweet as I expected they would be. Suggestions? Possibly a low fat blueberry Greek yogurt? Maybe some stevia? They are perfect other than the lack of sweetness. Thanks for the recipe and any suggestions you can offer. Have you tried putting smushed banana as a natural sweetener? I usually notice 2 bananas in most recipes that are looking for sweeter taste without compromising with sugars. Have you ever put all the ingredients together at once in a vitamix? No, but that should work OK. This looks amazing & I can’t wait to try. I’m used to using exact measurements, could you clarify what exactly is “1 cup” i.e 250 ml, 400ml? I know this may sound stupid, but a cup size can vary! It is exact, just American “exact” lol Most of my readers are American so I stopped including real cooking measurements because it confuses them. Thank you so much for this healthy recipe!! I just made them and my kids love them! Brown rice syrup is a good sweetener for babies, and a lot healthier than other choices like agave. Would you be able to add any banana to help make it sweeter? I add banana a lot for my little one and I always find it gives oatmeal and plain yogurt a nice sweet taste. Yes that should work nicely. OK, call me not very smart but what is meant by rolled oats? They are sometimes called whole oats or old fashioned oats? They are the whole oat flakes. Do you use full fat, low fat, or fat free Greek yogurt? Thanks! Low fat Greek yogurt is best. Can I substitute whole wheat or white whole flour instead of all purpose flour? And do the measurements need to change? Should be fine using the same measurements. I will be making these today. I dont have bluberries but a frozen combo of cherries strawberries and raspberries. They are much bigger then bluberries so I hope the muffins will turn ok. I have made these twice and am currently on my third time. Each time they have come out great! The only thing I changed was I used whole wheat flour because I didn’t want to buy any flour. They also store well for the week (I do a weekly meal prep on Sunday). I store the muffins in a Pyrex baking dish. Could you put this in a loaf pan? Liquid but either should be fine. These look so good and can’t wait to try this recipe! But I want know what can I sub for the all purpose flour? I made these today and yummmmmm. Turned out great, I sprayed muffin pan with canola spray, and muffins came right out. These are perfect for my new diet. Thanks for sharing. If I add banana to make it sweeter like some people have suggested, do I substitute the banana for any of the current ingredients? How many bananas do you suggest? Also, what kind of milk do you use (nonfat, low fat, whole, almond)? I would also like to know the answer to the banana question! Followed these exactly. They were rubbery ( my baking powder is new) and besides bites with a lot of blueberry, these were so bland. I think the only positive thing i can say is they seem pretty healthy. Maybe I already missed it in the comments somewhere, but has anyone tried parchment paper liners?